The volcanic Gran Canaria offers far more than the beaches it is best known for. Staying in Aguimes and remote Aldea, discover dramatic landscapes, steep gorges, high peaks and semi-tropical valleys, exploring the Isla on foot. Our trip starts in Aguimes a small, traditional town in the east of Gran Canaria, about twenty minutes from the island's airport. If you arrive early you may wish to explore the historic narrow streets with pretty painted houses of the 'old town', or find a quiet cafe to sit in to acclimatise to the pace of life. Today we make a walk along the main landmark of this side of the island - the stunning Guayadeque Canyon that runs south east along the slopes of Pico de las Nieves. There are lots of endemic plants, but the volcanic landscape has a lunar feel as we get closer to the deep gorge, reminiscent of Northern American canyons. We walk along a tarmac road for 30 minutes before heading into the gorge. This area has been inhabited since the stone age and the remains of cave dwellings from these times are still visible. As we walk we will also see some traces of lava fields from an ancient eruption of a smaller volcano. After the gorge we head back to Aguimes on foot. Please note there is little shade in the countryside around Aguimes, so strong sun protection is needed. Today's 12 kilometre walk is expected to take around four hours with 550 metres of ascent and descent. This morning we drive west to Tejeda, a small mountain village (1076m) with white washed buildings which for many is the prettiest hill village on Gran Canaria. There will be time for a walk around the town and a coffee before continuing to Cruz de Tejeda where our first walk of the day begins. We walk from here through the Tejeda valley with spectacular views across Roque Nublo. After a break in Artenara we continue to explore the Acusa cliffs with its white washed cave dwellings dating back to stone age times, some of which are still occupied (there is a short bus transfer to connect both walks). We then head for our next hotel in the west of the island, our base for the next three nights. Please note that the first section of the first walk has been affected by some forest fires, if this continues to be the case then we start walking 3km after Cruz de Tejeda. Today's first seven kilometre walk is expected to take around two hours with 200 metres of ascent and 650 metres of descent. The second three kilometre walk is expected to take around one hour with 100 metres of ascent and 250 metres of descent. 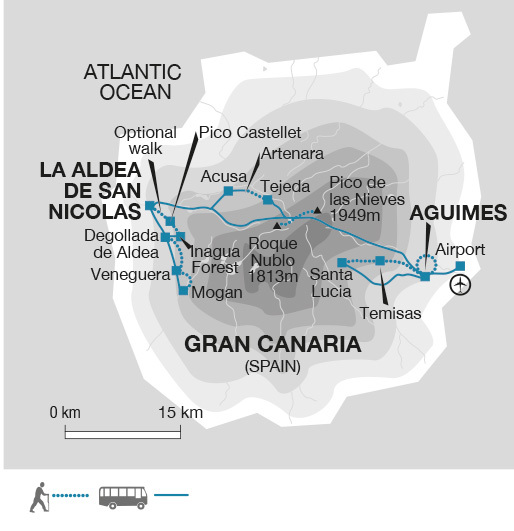 Hopping on the local public bus, we travel a short distance to the start of today's walk at the Aldea Pass (700m). From here we follow an ancient pathway that in former days connected the villages of La Aldea, Tasarte and Veneguara. It is an undulating trail with one steep but short downhill section. On our left-hand side we enjoy the impressive walls of Los Azulejos, green layered rock sheets topped by the Inagua Forest. When we reach the village church of Veneguera we take a short break for lunch before continuing our walk over the last pass that leads us into the Barranco de Mogan. Here there will be time for a coffee break while waiting for the public bus that will take us back to La Aldea. 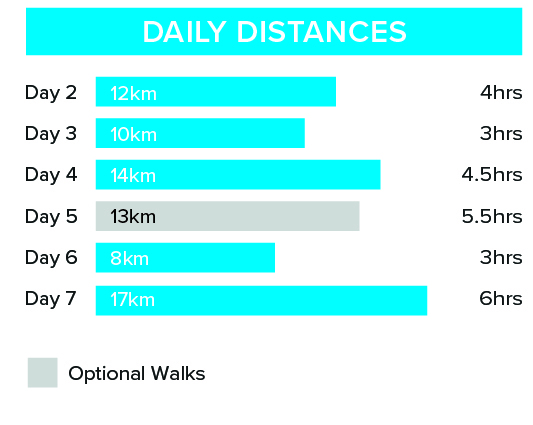 Today's 14 kilometre walk is expected to take around four-and-a-half hours with 250 metres of ascent and 400 metres of descent. Today has been left free. You may wish to relax around the hotel, enjoying the village life in La Aldea, or decide to go to the nearby beach five kilometres away. Further afield you could visit the city of Galdar and see the Cueva Pintada Museum to learn about aboriginal life on these islands - On your way back stopping off for a dip in the ocean. Alternatively keen walkers may wish to take the optional demanding walk through the Inagua Forest to the Pico Castellet, a flat rock outcrop with a spectacular view (this walk is only posisble if your Explore leader is able to accompany). Today's optional 13 kilometre walk is expected to take around five-and-a-half hours with 500 metres of ascent and 700 metres of descent. After breakfast we drive below the Picos de las Nieves (1949m) from where we make a gentle walk up to the summit of Roque Nublo, the landmark rock of Gran Canaria and offering great views across the island and - weather allowing - across to neighbouring islands of the Canaries.From here we drive back to down to Aguimes. Today's eight kilometre walk is expected to take around three hours with 220 metres of ascent and 500 metres of descent. Today we travel by local bus (50 min) to Santa Lucia for our long but scenic walk back down to Aguimes. As we start our descent we pass an old maize mill, before walking down into the Hondo Ravine and up to Lomo de Don Pedro. We continue eastwards to Temisas village following signed trails, then part of a 'Camino Real' marked out by stones to Aguimes town. Today's 17 kilometre walk is expected to take around six hours with 300 metres of ascent and 700 metres of descent. Our tour ends after breakfast, in Aguimes. The Canary Islands enjoy a relatively stable climate making them a good year round destination. The warmer temperatures in the winter months also make the islands a great winter walking holiday choice. The best months for walking are October to April, avoiding the heat of the summer, the evenings can still be chilly and rain is possible in January and February. The Canary Gulf Stream and trade winds provides each island with its own micro-climate, bringing different climatic conditions to each side of the islands. Overall, spring, early summer and autumn are ideal times for a Spanish trip - though the weather varies enormously from region to region. The high central plains suffer from fierce extremes, stiflingly hot in summer, bitterly cold and swept by freezing winds in winter. The Atlantic coast, in contrast, has a tendency to damp and mist, and a relatively brief, humid summer. The Mediterranean south is warm virtually all year round. Spain's Islands the Canaries and Balaerics experience very mild winters and warm summers making them ideal year round destinations. Bring light and comfortable clothing that can be layered according to the temperature. It can become cool, especially at night, so bring warmer layers. Tops made from wicking materials which keep you drier, a warmer fleece is recommended as a mid layer, and walking trousers are preferable to trousers of heavier material such as jeans. We recommend you bring walking boots with ankle support- leather or fabric are both fine. Make sure that your boots are worn-in and comfortable before the start of the trip. Also trainers or sandals for relaxing and general wear. We suggest that on international flights you either carry your walking boots in your hand luggage or wear them - should your luggage be lost or delayed, your own boots are the one thing that will be irreplaceable. Bring one main piece of luggage and a 20-30 litre day sack is recommended. You will need to carry what you need for the day which may include a raincoat, jumper, camera, sun-cream, water and picnic lunch. On hot days you will carry fewer clothes but more drinking water. -Personal first aid kit - On each walk a first aid kit is carried but you should have your own blister kit, supply of plasters, aspirin and other essentials. At your discretion you might also consider tipping your Explore Leader in appreciation of the efficiency and service you receive. Although entirely voluntary, tipping is a recognised part of life in this region of the world. Some local staff will look to members of the group for personal recognition of particular services provided. In order to make things easier for you, the Explore Leader may organise a group's tips kitty and if this is the case, they will account for it throughout the trip. Accordingly, you should allow approximately £15 for tipping. We recommend you take the majority of your spending money in Euros cash. We recommend that you change any currency into Euros prior to arrival. Bureau de Change are generally only found in major cities and large airports. In cities and most major towns. Visa and Mastercard are generally accepted in larger restaurants and some shops. This two centre trip gives you the flexability to unpack, get to know different areas of the island and the local people. The hotel in Aguimes has limited bedrooms and therefore depending on the number in the group, some travellers may be accommodated in their second facility which is around the corner. You will have use of the facilities at Hotel los Camellos and food will be served here. Our hotel in La Adiea is more basic than in Aguimes, this is the only hotel available in this area and it is perfectly situated for hikes on that side of the island. You will also have the option to enjoy a delicious home cooked meal on the evening of day three. Spain/Canary Islands: Visas are not required by UK, Australian, New Zealand, US and Canadian citizens. Other nationalities should consult their local embassy or consular office. Nothing compulsory but Tetanus is usually recommended as a precaution. Please check the latest requirements with your travel clinic or doctor prior to departure. The above is not an exhaustive list. Further information regarding vaccinations and travel health advice can be found by following the NHS and NaTHNaC links at Explore Travel Health and from your local healthcare provider. Visa and vaccination requirements are subject to change and should be confirmed by you before travelling. Walks on 5 days for between 2 to 6 hours, along undulating, well-maintained trails. There is an optional more challenging walk on day 5 to Pico Castellet. Vertigo sufferers need to be aware that some of the walks will be along paths next to steep drops. Find out our Adventure Travel Consultant Sarah Jayne's highlights of Gran Canaria and what makes its a great destination for some winter sun and walking!